PharmaMar (MSE: PHM) has presented during the AACR meeting (American Association for Cancer Research) in Chicago new data about how plitidepsin works on the tumor cells. Under the title "eEF1A2 interacts with and inhibits PKR to enhance cancer cell survival", the Company has presented the newly discovered oncogenic properties of eEF1A2, the target of plitidepsin. PharmaMar has discovered that this protein bond to the enzyme favoring in this way tumor growth. Plitidepsin inhibits this interaction obtaining the induction of cell death. Indeed, this is one step more in the understanding of the mechanism of action of plitidepsin. Up to today, PharmaMar has described that the target of plitidepsin is the eEF1A2 protein, over expressed in tumor cells, as in breast cancer or multiple myeloma. Through its bonding to eEF1A2, plitidepsin annuls the oncogenic properties of its target. For example, the bonding between eEF1A2 and Peroxiredoxin-1 controls the oxidative stress levels that favor tumor cell survival. Plitidepsin, on interrupting eEF1A2´s bonding with Peroxiredoxin-1, increases the oxidative stress levels, provoking tumor cell death. In the same way, plitidepsin interrupts the bonding of eEF1A2 with sphingosine kinase in the same way, an enzyme that regulates the level of the metabolites responsible for cell proliferation. The bonding of Plitidepsin to eEF1A2 inhibits the formation of the above mentioned metabolites, thus also limiting tumor growth. 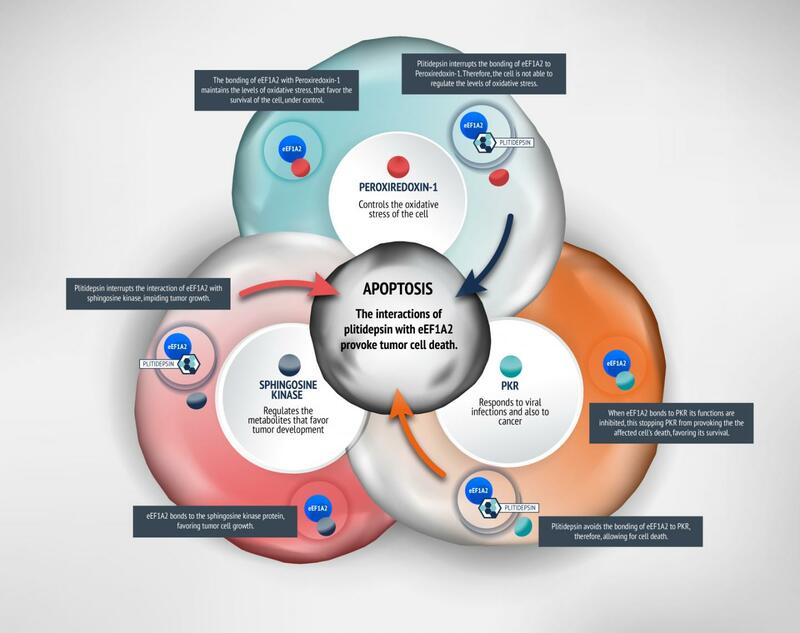 In all cases, the final consequence of these interactions of plitidepsin with eEF1A2 is the activation of a suicidal program of cells called apoptosis. Headquartered in Madrid, PharmaMar is a world-leading biopharmaceutical company in the discovery and development of innovative marine-derived anticancer drugs. The company has a pipeline of drug candidates and a robust R&D oncology program. PharmaMar develops and commercializes YONDELIS® in Europe and has other clinical-stage programs under development for several types of solid and hematological cancers, Zepsyre® (PM1183), plitidepsin, PM184 and PM14. PharmaMar is a global biopharmaceutical company with subsidiaries in Germany, Italy, France, Switzerland, United Kingdom, Belgium, Austria and the United States. PharmaMar fully owns other companies: GENOMICA, a leading molecular diagnostics company; Sylentis, dedicated to researching therapeutic applications of gene silencing (RNAi); and two other chemical enterprises, Zelnova Zeltia and Xylazel. To learn more about PharmaMar, please visit us at http://www.pharmamar.com.